Sweden is preparing for possible external or civil war! Sweden is preparing for war with Russia. Not by mobilising its armed forces, but by teaching its people how they can survive a Russian invasion. A leaflet titled If War Comes is to be distributed to the Nordic country’s 4.7 million households. It’s a modernised version of a pamphlet that was first issued in 1943, and contains instructions about civil defence measures, which belongings to take in an evacuation and how to use gas masks, among other vital information. “People need to learn and know about how to deal with it,” Christina Andersson of the Swedish Civil Contingencies Agency told local media. 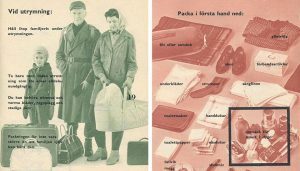 For the first time since World War II, Sweden is preparing to distribute a civil defense brochure to some 4.7 million households, warning them about the onset of war. The booklet will serve as a manual of “total defense” in case of a war, and provide details on how to secure basic needs such as water, food, and heating, the FT reported. The manual also covers other threats such as cyber attacks, terrorism, and climate change. “All of society needs to be prepared for conflict, not just the military. We haven’t been using words such as total defense or high alert for 25-30 years or more. So the knowledge among citizens is very low,” said Christina Andersson, head of the project at the Swedish civil contingencies agency. The survivalist manual or better known by some as a preppers guide is called “If Crisis or War Comes,” will be published by the government in late spring. Its publication comes at a time when the threat of war from Russia is high, well, possibly, but that is what the mainstream media has conditioned many to believe. What if the threat is not from Russia, but one that is domestic? On Wednesday, Prime Minister Stefan Lofven said that Sweden would do whatever it takes, including sending in the army, to end the wave of gang violence situated in the no-go zones around the country. Sweden’s murder rate has been relatively low over the years, but thanks to the migrant crisis, police are powerless in many areas across the country. “It’s not my first action to put in a military, but I’m prepared to do what it takes to ensure that the seriously organized crime goes away,” Lofven said after the party leadership discussion in parliament. “But it is also obvious that there are social problems. Last year 300 shootings occurred, 40 people were killed. The new year has begun with new launches. We see criminals with total lack of respect for human life, it’s a terrible development I’m determined to turn around,” he added. Even the Swedish Democrat leader Jimmie Akesson “declared war” against organized crime and suggested that Sweden should deploy the military to no-go zones to counter the out of control violence. “People are shot to death in pizza restaurants, people are killed by hand grenades they find on the street,” Akesson said in parliament on Wednesday. It is not only Russia, but gangs, and apparently immigrants, that are behind some decisions that the Swedish government is now taking. I have been warning for years at this news page that civil war may be expected to come to Europe. Civil unrest in Europe is expected. Places such as France, Germany, Spain, Portugal, Italy, and Eastern Europe have potential for this occurrence. In addition to austerity measures, Islamic protests and immigration related issues will also likely be factors in flaming protests and devastating riots. Expanded civil unrest will have major impacts on the euro and on Europe itself. We are seeing Islamic immigration issues raising concerns throughout Europe, and this is not done yet. Civil unrest and/or civil war will erupt in Europe. Places such as France, Germany, Spain, Portugal, Italy, Austria, Greece, Sweden, and Eastern Europe (like Slovenia, Croatia, Moldova, and Bulgaria) have potential for this occurrence. In addition to Islamic protests and immigration related issues, trade and austerity will also likely be factors in flaming protests and devastating riots. When my wife and I were in Sweden last May, we heard first hand that Swedes have concerns about what to do with the Islamic immigrants. Now, their politicians seem to be a little bit more open about it. Perhaps I should mention that the Germans now require their people to prepare for disaster (see Europeans ‘prepping’ for terror and war; Estonia wants Germany to defend it and/or watch Physical preparedness for Christians). War will be coming to Europe! Ten Prophetic Clues Concerning Naphtali – Sweden Do the Swedes have any ties to the biblical tribe of Naphtali? Some think so. Sweden going to ‘666’ cashlessness? Sweden continues to reduce the amount of currency notes and coins in circulation as more and more Swedes turn to digital forms of payments. Even ‘farmers’ markets’ take debit and credit cards. Will this eliminate crime or lead to the rise of the Beast and Antichrist power? Could what is happening in Sweden a prelude to the control of buying and selling that Revelation 13:16-18 associates with 666? Dr. Thiel addresses these issues from Stockholm, Sweden. Physical Preparation Scriptures for Christians. We all know the Bible prophecies famines. Should we do something? Here is a version in the Spanish language Escrituras sobre Preparación física para los Cristianos. Here is a link to a related sermon: Physical preparedness for Christians. War is Coming Between Europeans and Arabs Is war really coming between the Arabs and the Europeans? What does Bible prophecy say about that? Do the Central Europeans (Assyria in prophecy) make a deal with the Arabs that will hurt the USA and its Anglo-Saxon allies? Do Catholic or Islamic prophecies discuss a war between Europe and Islam? If so, what is the sequence of events that the Bible reveals? Who does the Bible, Catholic, and Islamic prophecy teach will win such a war? Anglo – America in Prophecy & the Lost Tribes of Israel Are the Americans, Canadians, English, Scottish, Welsh, Australians, Anglo-Saxon (non-Dutch) Southern Africans, and New Zealanders descendants of Joseph? Where are the lost ten-tribes of Israel? Who are the lost tribes of Israel? What will happen to Jerusalem and the Jews in Israel? Will God punish the U.S.A., Canada, United Kingdom, and other Anglo-Saxon nations? Why might God allow them to be punished first? Here is a link to the Spanish version of this article: Anglo-América & las Tribus Perdidas de Israel. Information is also in the YouTube sermons titled Where are the Ten Lost Tribes? Why does it matter? and British are the Covenant People. A short YouTube of prophetic interest may be: Are Chinese threats against Australia for real? Why Terrorism? Is Terrorism Prophesied? What does the Bible teach? Which nations may be affected? Here is a link to a related sermon: Terrorism, Christianity, and Islam. Russia and Ukraine: Their Origins and Prophesied Future Russia in prophecy. Where do the Russians come from? What about those in the Ukraine? What is prophesied for Russia and its allies? What will they do to the Europeans that supported the Beast in the end? There is also a video sermon available: Russia in the Bible and in Prophecy and a video sermonette available: Ukraine in Prophecy? Ezekiel 38: For Russia & Iran in Our Day? Is Ezekiel 38 about to be fulfilled? A related video is available titled Ezekiel 38: For Russia, Ukraine, & Iran Now? Another could be Russia, Iran, Syria, & the Bible (Code). Persecutions by Church and State This article documents some that have occurred against those associated with the COGs and some prophesied to occur. Will those with the cross be the persecutors or the persecuted–this article has the shocking answer. There is also a YouTube video sermon you can watch: The Coming Persecution of the Church. Here is information in the Spanish language: Persecuciones de la Iglesia y el Estado. This entry was posted on Thursday, January 18th, 2018 at 4:00 pm	and is filed under Prophecy. New Nordic Military for Civil Unrest?